With reviews and comparisons leaning toward Honda’s Accord, Toyota makes some moves to keep its Camry in the number one spot. Indications are that Toyota is increasing its discounts and incentives on the new 2018 Camry. Although low by comparison to some cars, like the Chevy Malibu, the Camry’s discounts seem to be about triple that of other recently updated competitors. Here’s why. Read any automotive comparison, whether it be Toyota Camry vs. Honda Accord, or Camaro vs. Mustang and by the end, you will know which car the author thought was the better driver’s car. You will know the horsepower, the fuel economy, and maybe which has Apple car Play and Android Auto and which does not. At the end, a clear winner will be selected and shoppers will be given all the info they need to decide which is right for them (or which the reviewer thinks is right). And then shoppers will go buy the one with the deepest discount off the MSRP. At least in many cases. Some shoppers look deeper than discounts. They look at safety ratings, reliability records, cargo space, and whether the car has that special item they really hope for, like a heated steering wheel or Android Auto. However, the fact remains that automakers carefully manage their incentive spending and advertising programs to make the most of whatever situation their particular model happens to be in. In general, discounts, cash-back, and free financing tend to be increased when a given model is aging in its design life. Brand new models generally are not discounted heavily. Those that are getting crushed by the competition, like say the Chevy Malibu, offer crazy discounts, like the Malibu’s current $5500 to $8,000 off MSRP. The new 2018 Toyota Camry is doing well. In December, the Camry broke 43,000 units for the month. That is an amazing number and for reference was about twice what some other popular midsize models sales were. However, Toyota is not really trying to beat the competition in general. It is mainly concerned with fighting off the hot new 2018 Honda Accord, which reviewers are almost unanimously choosing as the best new midsize sedan in America in terms of driving experience factors. Although the 2018 Camry is doing well vs. the Accord, Toyota seems to be hedging its bets a bit and offering up discounts that are about triple what Honda is offering on the new Accord heading into calendar 2018. This is an unusual move by an automaker for a model still in its first year of sales. However, the discounts are getting the attention not just of shoppers on lots, but also the media. U.S. News Autos has again picked the 2018 Camry as a “Best Car For the Money” for the month of February. That makes three of the past four months that the new Camry has earned a spot on one of U.S. News’ value listings. Will the extra dollars and Toyota’s reliance on safety, durability, quality, and reliability keep the new Camry ahead of the car-guys’ favorite? Time will tell. Typo "Ford vs. Mustang"?? BTW CR ranks Camry over Accord. Braking is also quite a bit better with Camry. Note the Camry better headlights (IIHS rating) are for the optional adaptive version available only with XLE. The standard versions rate the same as Accord. 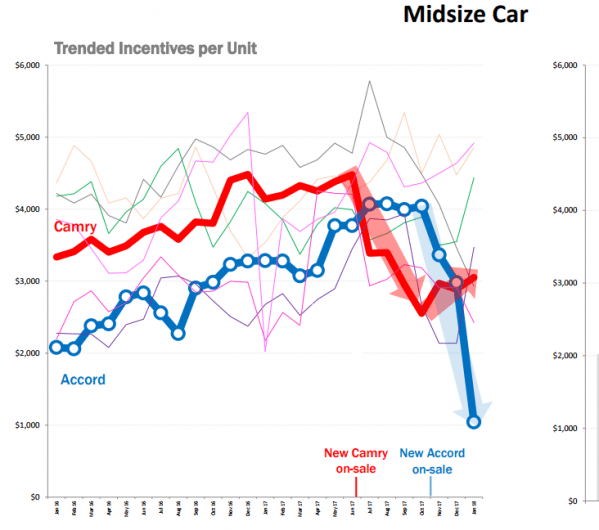 What is the source of the incentives graph? Thanks Joel. We fixed up that "Ford vs. Mustang" typo after you brought it to our attention. The source of the incentives graph is Motor Intelligence. We took a peek at the public Toyota sales websites and the Camry incentives seemed to match the graph pretty closely as best we could tell. Good points about the Camry and Accord safety. An unfortunate Toyota Dealer pricing practice occurring here in Florida: Along with the mandated Monroney Window Sticker, dealers are pasting an additional – put-it-to-the-customer – sticker of approximately $2k. There are also additional charges tacked on by the port distributor. What is gotten for an approximate $3k total markup is a number of useless unwanted items. These unsavory practices tarnish the Toyota name. This customer's reaction is to never purchase a new Toyota vehicle in the Southeast District; I don't want to be identified as having been duped.